A video of Sen. Cindy Hyde-Smith, R-Miss., who faces a runoff this month against an African-American Democrat, joking about attending "a public hanging" went viral Sunday as she insisted there was nothing negative about her remark. 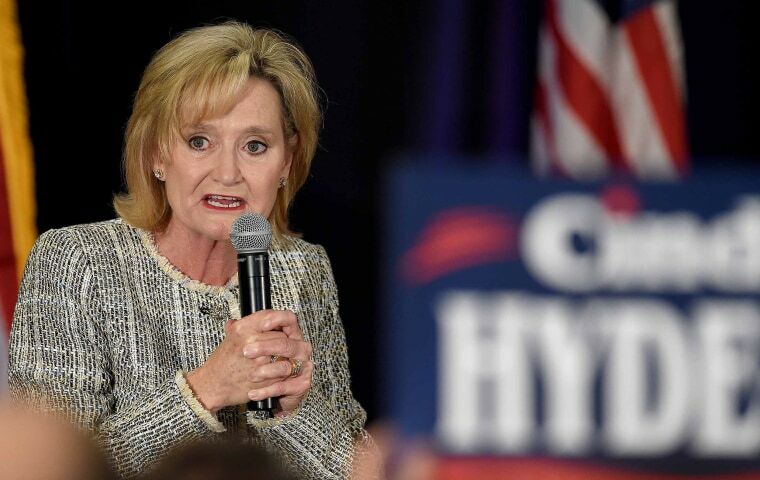 "If he invited me to a public hanging, I'd be on the front row," Hyde-Smith said during a campaign stop in Tupelo, Mississippi. The man she was referring to was identified as a local rancher. The runoff election between Hyde-Smith and former Secretary of Agriculture Mike Espy is Nov. 27. The video was posted by Lamar White Jr., the publisher of The Bayou Brief, a nonprofit newssite in Louisiana. White told Mississippi Today that he did not take the video, and it was recorded on Nov. 2, before the election. Mississippi has a difficult racial history that includes 581 lynchings from 1882 to 1968, the most of any state in that period, according to the NAACP. Hyde-Smith, who's running to complete the final two years of the Senate term she was appointed to in March to replace Thad Cochran, dismissed the remark in a statement Sunday night. "In a comment on Nov. 2, I referred to accepting an invitation to a speaking engagement," Hyde-Smith said. "In referencing the one who invited me, I used an exaggerated expression of regard, and any attempt to turn this into a negative connotation is ridiculous." Espy said Hyde-Smith's remark showed why she was unfit to represent the state. NAACP President and CEO Derrick Johnson, who is from Mississippi, said in a statement that Hyde-Smith's "decision to joke about ‘hanging,’ in a state known for its violent and terroristic history toward African-Americans, is sick." The racial elements of the comment were lost on few in a state where 38 percent of the population is black, and it earned a fair amount of backlash on social media. Don’t bring up “public hangings” in Mississippi. Neither Hyde-Smith nor Espy broke 50 percent of the votes on Nov. 6, both eking out slightly more than 40 percent, prompting the runoff. Republican Gov. Phil Bryant appointed Hyde-Smith to the seat in April, and she has since earned the approval of President Donald Trump, who campaigned for her last month in Mississippi. Hyde-Smith was the state's agriculture commissioner and a state senator. She was a Democrat until 2010, when she switched parties. Hyde-Smith is the first woman to represent Mississippi in Congress. Espy, her opponent, would be the first black man to serve as a senator from Mississippi since Reconstruction and the first Democrat since John Stennis retired in 1989. Alex Johnson and Allan Smith contributed.